On a more mundane note, we have now more or less got the candle drill sorted. 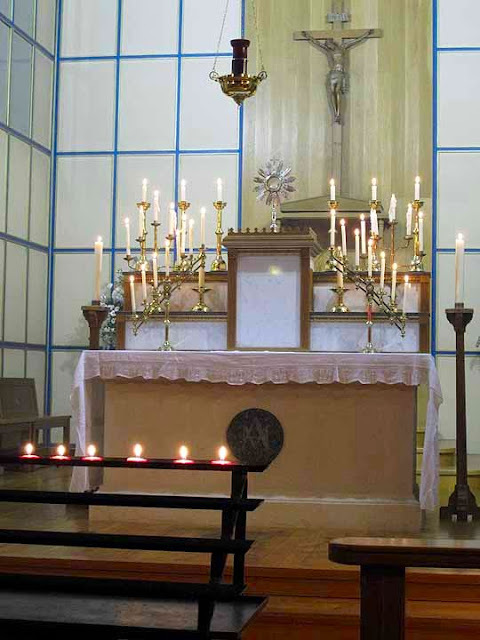 The thinnest candles, those in the Benediction candelabra, last about seven hours, though draughts and changes of temperature (last night was only just above freezing outside) can make some of them misbehave. The photo above is from a previous year - some of the candles were too close to each other and couldn't stand the heat. This year we reduced to a modest thirty candles and they mostly burned politely. It has been a busy few weeks, liturgy-wise. The anniversary of the consecration of the Church is on 2 October, and the feast day on 7 October. With the Quarant' Ore Masses and tomorrow being Sunday, that will mean four Missae Cantatae in as many days. Next week will be the same, with All Saints, All Souls, the visiting schola on Saturday and the normal parish Mass on Sunday. I have booked a couple of days off after that and I'm beginning to feel that I will need it. Next year, I think we'll move the Forty Hours to early summer.